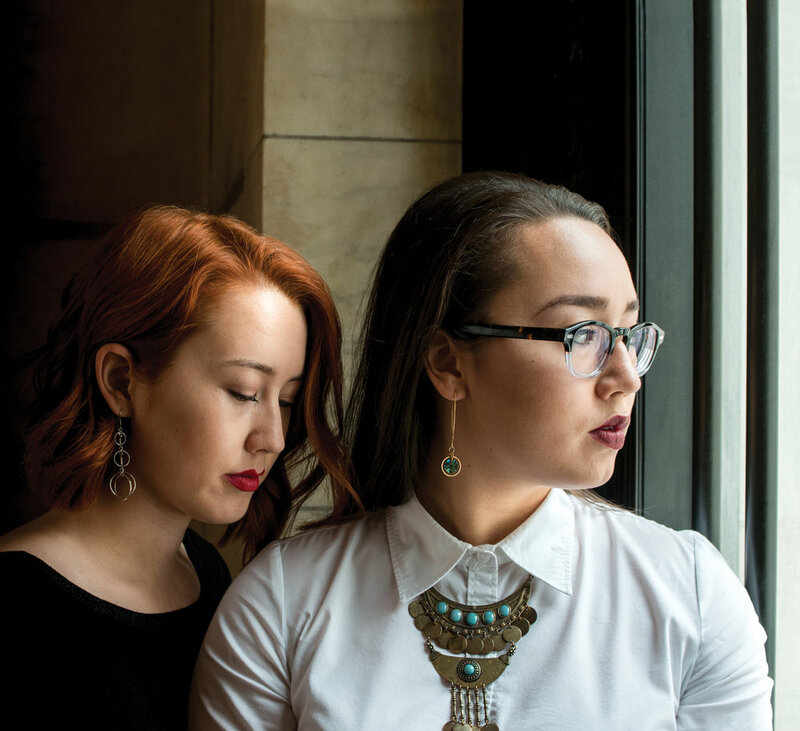 Meet Chasing Lovely, a Hapa music duo. When I first heard of them, I thought, “How cool!” Then I listened to their latest EP, Things We Don't Talk About. I don't know what I was expecting, but it wasn't the lush sounds, the big voices, and the Southern twang of Chasing Lovely. I fell in love. The duo is made up of half-Korean sisters, Chloe and Taylor. That's right, it's a sister act. There’s so much to talk about, where to begin? How about the music? Chasing Lovely, to me, sounds like a mix of Adele and The Civil Wars. The duo took the time to speak with Hapa Mag! Chasing Lovely: Different artists inspire us for different reasons. We love duos like The Civil Wars and JohnnySwim because they have a great command of vocal harmony. NEEDTOBREATHE is one of our favorite bands because of their ability to strike a balance between having really soft, emotional songs and whip-your-hair-back-and-forth rock n' roll jams. Conversations with our friends, books we've read, movies we've seen, or even the daily news also influences our music. The Southern vibes you're picking up on in our music are likely due to the fact that our dad played us a lot of country music growing up. Artists like the Dixie Chicks, Collin Raye, Alison Krauss and Union Station. We moved to Nashville in 2011 and lived there for six years, which definitely influenced and inspired us. We relocated to Atlanta, Georgia, this past April so we've been living in the South for about six and a half years. You can see that influence in their lyrics. I think their lyrics read as Southern Gothic, ripped from the pages of Kate Chopin and Anne Rice novels. There's a poetry to each verse, complete with imagery reminiscent of Harper Lee. Take for example the song "Always and Never Enough." The content and inspiration is ripped straight from the headlines. Chasing Lovely: Our song “Always & Never Enough” was initially inspired by an overwhelming feeling of helplessness—whether that was in regard to what we were seeing in the news (Syrian refugee crisis, police brutality, climate change, the election) or what was happening personally in our lives and relationships. Taylor was inspired to add the verses about America after watching the 2016 Roots TV miniseries. When it comes to our lyrical content, we want the freedom to say what's on our mind, which is why we've done that from the very beginning. We've never held back on speaking out about how we feel because we don't want it to come as a shock to people later on. If we are too bold and honest for some people, that's okay and they can choose whether they want to continue following us and our music. For us, it's better to have a smaller audience of people who like us for who we authentically are. Taylor (the red-head) does most of the song writing. But that's not how it began. Chloe was the one who first received a guitar. CL: Chloe got into music first. She asked for a guitar at age 8, finally got one at age 10 and started uploading cover songs to YouTube in 2009. Taylor encouraged Chloe to write her own songs to no avail and eventually asked Chloe to teach her a few chords on the guitar so she could write songs for her. Taylor wrote her first song in 2010 when she was a junior in high school and the rest is history. Up until this past year, Taylor has done most of the songwriting solo. But we work really well when we write together and the songs we have produced collaboratively have been some of our best. We generally start by opening up to each other about how we've been feeling and toss out several song ideas. Sometimes Taylor will have a short bit of a song started and we'll work from there. Chloe has a great way of verbalizing ideas and concepts, and Taylor takes those and turns them into lyrics. Clearly these girls get along better than most siblings. While sibling acts are nothing new, they are becoming rarer. You've got 30 Seconds To Mars (Jared and Shannon Leto’s band, and my guiltiest pleasure). But you don't see Beyoncé and Solange touring together anytime soon. So how is it working side by side with your sister, and and how is it running a band, writing music, and touring with your sibling? CL: It's awesome! We have very similar tastes in music and aesthetically. So whether we're writing music or brainstorming the visuals for our next album, we're generally on the same page. Touring is a breeze because we have the same weird sense of humor, we are always in the mood to eat the same thing (which makes it easy to split meals!) and we cooperate. Chloe is great at packing. She can fit so much into a suitcase! And our car. Taylor carries all the equipment and luggage out to our tiny Hyundai Accent and Chloe gets it to all fit inside somehow. It's really fun to perform with your sister. When you're having a great show, the energy is like nothing else! But when you're having a rough show and it seems like no one is listening, it helps to have the emotional support of someone who is right there beside you—encouraging you. And what about being Half-Korean? I was especially curious about why the girls had put it on their Instagram. It's not every day people get to/can celebrate their mixed race roots without fear of being seen as a risk. Chloe Bennet is a Hapa who knows that better than most. But like Chloe, these artists take pride in their mixed heritage. CL: When we started playing music, we didn't always put our Korean-American identity out there so publicly. But people are always curious about our background and ask us questions like, "What are you?" and "Are those your real eyes?" which is why we decided to write that blog post. We've found that sharing our identity has helped us connect with other Asian and mixed-raced people, which has given us a new sense of community that we never had before. And for everyone else who is just curious, it helps answer some of those immediate questions that they have about us. Not all Asian lives on the coasts. Some of us are in the Midwest (yes, we exist.) So not only are Chloe and Taylor mixed, they’ve also got a total different Hapa experience than most. CL: Being mixed and having lived in both the Midwest and the South, we have found that anywhere we go, we still get a lot of curiosity about our background. Being mixed is such a unique experience because depending on the day, we may be perceived as just White or just Asian. We have been in the South for just over six years now and didn't run into many other Hapa or Asian people in Nashville. But since we've moved to Atlanta, we've been pleasantly surprised to find a larger Asian-American community here, and more specifically, a pretty significant Korean community! Speaking of their blog, it’s worth noting that’s where the name Chasing Lovely came from. And these ladies have amazing style. I couldn’t help but notice that their fashion game is on point. And since we at Hapa Mag have our own beauty insights, I had to ask about theirs. CL: We love bold lipstick colors—especially dark, vampy ones in the fall. Our favorite lipsticks are "Divine Wine" and "Rich Ruby" and "Burgundy Blush" and "Touch of Spice" from Maybelline's Color Sensational Creamy Mattes Lip Color. Taylor also loves mixing Clinique's "Blushing Coral" and "Raspberry Glace" lipsticks for an every-day, more natural look. And lastly, we can’t talk about being Hapa without talking about food! Being Hapa, we're literally an Asian fusion. Which means we get the best food! Chasing Lovely features a couple of amazing recipes, and even contributed a recipe to this issue! So it’s safe assume they love food as much as we at Hapa Mag do! CL: Yes!! Food is another one of our passions. We love cooking and baking. And cookies are our weakness! We'll make a big batch of cookie dough and only bake a few cookies, then put the rest of the dough in a tub in the refrigerator so we can have fresh baked cookies whenever we want for the whole week! It's a literal addiction. We also love Italian food, especially Neapolitan wood-fired pizza (we recommend Punch Pizza in the Twin Cities). Chloe is obsessed with pasta to the point that she has her own pasta crank to make her own homemade pasta. We also loooooove Thai food! We eat it constantly when we're out on the road. Taylor always orders Pad See Ew with steamed tofu and Chloe gets pineapple curry fried rice. Taylor's best friend is Iranian and her mom makes the most delicious Persian food. We also love Indian and Ethiopian cuisine, which we were exposed to while touring across the country. Chasing Lovely’s latest EP Things We Don’t Talk About is out now on Apple Music, Spotify and on their website! Melissa Slaughter has lived in all four time zones in the contiguous United States. A former actor in Seattle, WA, Melissa now resides in NYC as a content creator. She is the producer of the We're Not All Ninjas podcast, which she also hosts with fellow Hapa Mag writer, Alex Chester. Melissa also writes for online blogs Nerdophiles and On Stage Blog. Find her @NotAllNinjasPod.